If you would like to make an individual contribution click the "Donate" button. This feature is used to make a single donation, tithe, or general offering. If you have a PayPal account log in using your email address and password. If you do not have a PayPal account you can still make a contribution by filling in the billing and credit card information on the secure PayPal account. 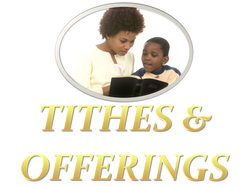 If you would like the convenience of setting a monthly tithe or offering using the secure PayPal recurring payment feature choose from the dollar amounts listed in the option menu on the right. Please add your church Member ID which is the four digit number located on your tithing envelops.